A connection charge, if applicable. Prorated charges (from your first day of activation to your bill date). Your next full monthly charges in advance. These one-time differences in your bill are explained in section 4 – Other charges and credits. Your Bill Date and other important numbers you’ll need to manage your account. Your Mobile Number, which will help you use the automated phone system to check your account balance or make payments (dial *6-1-1 from your mobile phone). Your Account Number, which can be used to verify your account when speaking with a customer service agent. Your Client ID Number to help you make payments online or through telephone banking. This portion of your bill highlights your Client ID Number. You can use this number for online banking and telephone banking. 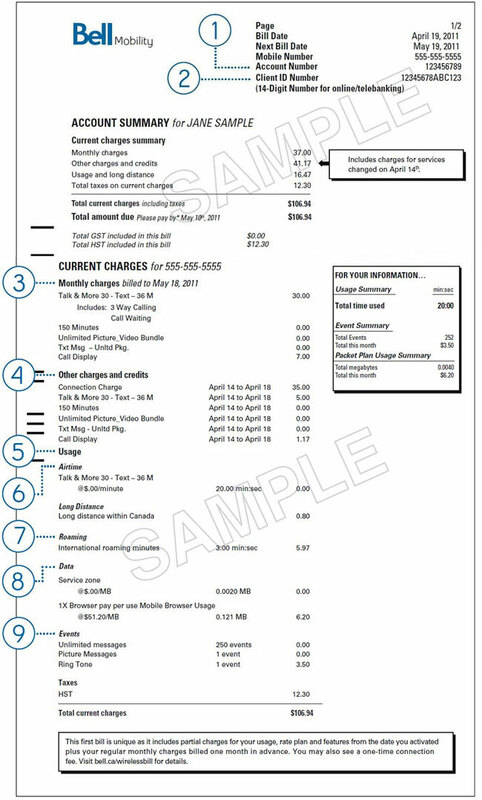 In this section of your bill, you’ll see your monthly rate plan, features and services along with their associated charges. All rate plans and features are billed one month in advance. For example, if your bill date is on the 19th, you will find the monthly charge for your plan from the 19th of this month to the 19th of next month. In addition, you may notice a monthly 9-1-1 Fee. Finally, any other monthly charges you have selected at the point of activation or at a later date (e.g. Text messaging bundle) will be listed here, in addition to any promotions you were eligible for when you activated your account. If this is your first bill, this section will detail prorated monthly charges and credits that have been applied to your account, but only for the time between the date you activated your service and your bill date. For example, if you activated your service on the 14th and your bill date is the 19th, your first bill will include charges for five days (the 14th, 15th, 16th, 17th and 18th). Your usage minutes are allotted in the same way. Prorated charges and/or credits will appear on your first bill only and apply to your regular monthly rate plan and features, as well as any other additional monthly services (e.g. the 9-1-1 fee, Long distance fee or other promotional features). You may also notice the one-time Connection charge appearing on your first bill. Additional usage charges are incurred on any services that you use outside what is included in your regular monthly rate plan, and they are billed for the previous month. Examples include additional airtime minutes, long distance calls, in-plan messages sent and received, Mobile Browser megabytes, music downloads and roaming fees. You can easily track your usage through My Bell or by using our self serve options. Details total minutes used. Charges will appear if usage has exceeded the minutes in the rate plan. Details voice and data roaming usage outside of Canada. Details data usage - measured in megabytes (MB) - including mobile/web browser, email, downloading/using apps, BlackBerry® Messenger and other instant messages. Details events such as text, picture and video messages, ringtone purchases, game and app fees, music downloads, etc.